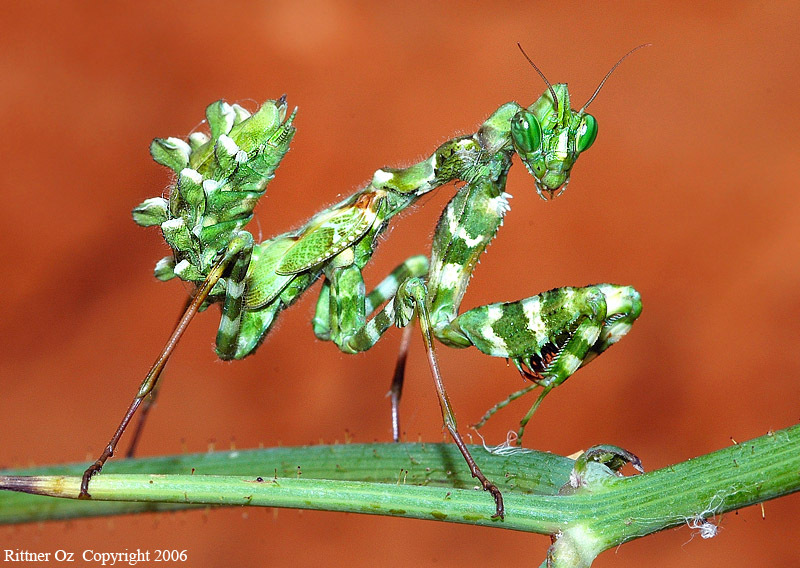 Blepharopsis mendica is one of the most lovely Mantises in Israel. it size can reach about 7-8 cm. It is distributed in north Africa and,almost all parts of Israel and neighenouring countries. The photographed specimen is a young nymph. What an amazing mantis, its camouflage is superb. Focus is great and superb contrast against the redy-brown background. What a fantastic, alien creature! Weird body, colours, camouflage. Evil eyes. Very aggresive pose :-) Sorry, I don't like mantises :-) This photo is fantastic! Orange BG works very good here. Superb work. I welcome continuation of a brilliant series of pictures. Amazing combination of classical pair colours: red and green. Exclusive sharpness, transparency and cleanness of a picture, DOF and composition. Bravo. As always - perfect shot. Very good colours and sharpness. A wonderful creature that shows that Nature is limitless playing with shapes!! A beautiful animal and a technically perfect shot! Excellent quality, sharp, details and colors. The Background really brings out this lovely image of the mantis. The shot is very sharp and well exposed. A great, great shot. Beautiful POV and colours. Added to my favs ! Very impressive shot, kind of rare one here. BG color fits very well with the subject. To me, flash is a bit disturbing as it flattens the subject. Was it really necessary with the available light you had? Nevertheless strange creature well worth a big smiley! Hi Oz, nice macro with great details. And I love the red BG. Unbelievable, I have not seen anything like it here. We have Leaf Insects which are similar but I am unaware of any Mantids of that Genus here. A perfect example of camouflage, Oz. Very well taken picture of this cunning creature with great POV, DOF, colours and clarity. congrats u for this superbe bg. nice strong colors and a wonderful blurred bg. well done & take care, thor. You are so good at these macro shots! Great details, and sharpness, lovely colors! extraordinary picture ... artistic (not only the balancing Mantis). Light, colours and sharpness are perfect. Go on ... this way! I never thought there could be an animal on our earth looking like that!!! O my god - ugly, beautiful, interesting - what will be the right words for this one? F�licitations pour la nettet� l'�clairage et la beaut�e de l'insecte. That is a most amazing-looking creature, Oz. Great capture of this young nymph with sharp details and excellent POV. What a tangled-up pose. It takes me a while to sort his legs out. That is truly one of the best features of TN... that we get to see some of the most incredible forms of nature throughout the world, thanks to members like you. The more we see the better we like it! What a stunning shot Oz! Looks like a soldier with his camouflage! This is what I call an image that worth more then thousand words! Wow what a clear, sharp and well focused Mantis. The redish background is wonderful in highlighting his interesting features, well done. Superb! Both photo and the species you captured! Congratulations! Wooooooooooow ! This mantis is incredible ! And your shot is amazing !!! Beauty and quality here. Bravo Oz and thanks for sharing. Amazing attention to detail. Did you use the camera's built in flash or an add on? I like the contrasting colours of the subject and the background and also the attitude. Impresionante macro de este maravilloso e incre�ble Mantis Oz. Perfecto DOF y POV con un fondo limpio que permite disfrutar de los detalles del "monstruo". Impressive macro of this wonderful and incredible Mantis Oz. Perfect DOF and POV with a clean backdrop that allows to enjoy the details of the "monster". Fantastic macro! this mantis is amazing and you did a very nice shot of it. Excellent macro. The details are very good, the color of the background is beautiful. Detecting such a creature seems to be quite hard due to it's color.